Earlier this year I wrote a blog post about art collector homes on Canada’s west coast, Vancouver Island. I’m not sure if it is the hot real estate market in Victoria BC, or my artwork on the walls, but something is happening here in BC and I am pleased to have my work prominently on display in these stunning homes. Earlier this year one of my collectors put their Cordova Bay dream home on the market, minus the artwork, though the bidders were hoping to have the paintings included in the sale. This month another collector, this time in Oak Bay has their stunning custom home on the market, a beautiful three-storey stunner, with an Olympic Mountain view. Last summer I installed a custom painted, commissioned work of art on their wall with a view. I take on very few commissions as it takes time away from my core work as a professional artist, however in this case I was happy to oblige as the scale of the work and the idea sounded like a fun detour for a month. These commissioned paintings offer me a chance to get inside someone else’s head for a while and allow me to mentally stretch as an artist. In some cases they challenge me in new subject material and open me up to expressing views outside of my core work on canvas. It is a collaborative experience where the client is expressing their creativity through me, the artist. After all, we are all creative, but we are not all artists, or painters. As an artist I have the patience to commit myself to a month long process of creating something custom tailored to suit the client’s creative aspirations and vision. I bring my expertise with colour, form, composition and style, creating the perfect painting for the couple who will forever own the piece and pass it down to the next generation of art lovers. Breathtaking views of the Salish Sea from this incredible custom residence situated in Victoria’s oldest and most sought after address, on King George Terrace in Oak Bay. 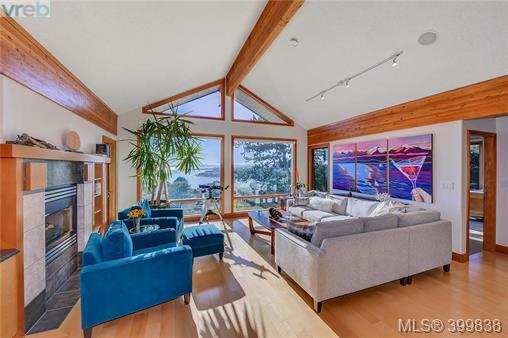 Built in 1999 to exacting standards, this home features impressive views, amazing sunsets and the ocean activity in the channel. 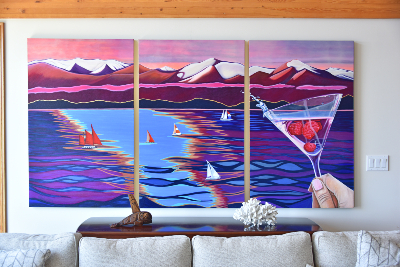 The final painting was designed to echo the view out the main window, with sunset colours and sailboats, as you watch them sail by all year round, and by the hundreds during Swiftsure yacht race. It is a view where you can enjoy a glass of champagne, your favorite wine or in this case a martini with raspberries. Read more about commissioning a painting from The Art of Brandy Saturley here.